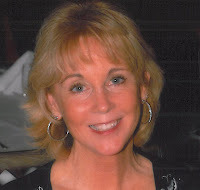 Talented author Christa Allan is allowing me to guest blog at her site today. Hope you'll join us there. 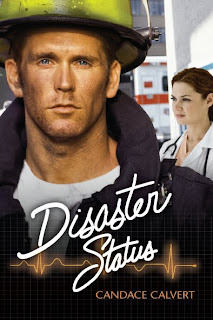 Candace Calvert is a former ER nurse who writes medical stories that she describes as “Grey’s Anatomy finds its soul.” Her latest novel, Disaster Status, releases April 1. Be sure to leave a comment at the end of this post for the opportunity to win a signed copy. Although Candace has lived in Texas for the past several years, I'm sorry to say that she's recently moved back to her native California. However, since it will allow her to be closer to her grandchildren, I'll forgive her. I think you'll enjoy getting to know Candace, and I appreciate her taking time away from packing to introduce herself to my readers. RM: You’ve had some hard knocks in your life that you say shaped who you are today. Would you share some of that with my readers? CC: Yes, hard knocks (quite literally) that I now count as blessings. Beginning in late 1996, I endured the Triple Whammy of events that turned my life into what can only be described as “a bad country song.” First, there was the painful and unexpected end of my 24-year marriage; followed by the northern California floods of January1997. Torrential rains and breaking levees swept a tide of muddy water (and fish, crawdads, dead rabbits, pesticides!) across our little ranch, forcing this newly single mother to gather my children, make emergency arrangements for animals and evacuate on a few hours’ notice. Just a few months later, my hopes for a merciful spring were challenged when I was thrown from my young horse, ending up “on the other side of the stethoscope” in my own trauma room. I suffered eight fractured ribs, a bleeding lung, two back fractures, a broken neck and spinal cord injury. The neurosurgeon said I was millimeters from the fate of my long-time hero Christopher Reeve. I like to say that God took drastic measures to get my attention. And I began to listen. RM: I understand that your writing career was launched by the story of your recovery, “By Accident,” published in Chicken Soup For The Nurse’s Soul. How did that come about? CC: Journaling has been an outlet since I was a child. During the months after my accident, I spent long hours writing (typing, hunt-peck, since my right hand was too weak to hold a pen). At the request of my pastor, I wrote a testimony for my church—the story of my accident and the restoration of my faith. It was later selected out of some 2,000 entries to appear as one of 101 stories in Chicken Soup for the Nurse’s Soul. When that book hit the NYT list, I felt like I was “almost one percent of a best selling author.” And I was hooked! RM: How difficult was it to make the transition from ER nurse to writer? CC: Difficult initially, because working 12 hour shifts made for little writing time. But I’m sure you’ll agree that medical folks have huge backlogs of “story material.” How can we not, when we’ve experienced the gamut of human emotion and drama (tragedy, joy, fear, hope, love, frustration, rage . . .) on a daily basis for years? We all have stories. And, for me, reaching out to readers—offering hope and encouragement while entertaining—feels natural, and much like being a nurse. I love it. RM: Tell my readers a bit about the Mercy Hospital series. CC: The Mercy Hospital series offers readers a chance to “scrub in” on the exciting world of emergency medicine, along with charismatic characters, pulse-pounding action, tender romance, humor, suspense--and an encouraging prescription for hope. I’m honored by this endorsement of Critical Care by author Dr. Harry Krause: “Finally a reason to turn off ER and Grey’s Anatomy. Here is realistic medical drama with heart.” My Tyndale House publicist claims that I write “Hope Opera”—I like that! RM: And can you give us a taste of Disaster Status? “Charge nurse Erin Quinn escaped personal turmoil to work on the peaceful California coast. But when a hazardous material spill places Pacific Mercy Hospital on disaster status and stresses staff, she's puts to the test. And thrown into conflict with the fire department's handsome incident commander who thinks her strategy is out of line. RM: What’s next from the prolific pen of Candace Calvert? CC: I’m working on the first of several new medical dramas set in Texas—the Lone Star Mercy series. I’d also like to try my hand at romantic medical suspense; it seems natural because I’ve published mainstream mysteries, and because I always manage to infuse suspense elements into the plots of my medical dramas. RM: And, even though this sounds like the warden when the governor denies clemency, I always ask my guests: Any last words? CC: (Grinning) I’m delighted to see that we are already sharing a readership, Richard: Code Blue and Disaster Status are even being offered in combination on some online sites. And it appears that Code Triage and Medical Error will released simultaneously this autumn—what wonderful company! Let’s plan to continue to keep our readers scrubbed in for “double shifts”, just like in the hospital. I’d also like to invite your readers to visit my website, my blog, RX Hope, and my FaceBook Fan Page, where I often do book giveaways. Thank you for hosting me on your blog, I’ve enjoyed this time with your readers. Thanks, Candace. I’m looking forward to reading Disaster Status. Readers, don’t forget to leave a comment for a chance to win a signed copy (unless it's illegal in your state). I’ll post the name of the winner in a week or so. I'll be teaching this year at one of the most prestigious Christian writer's conferences in the nation: the Mount Hermon Conference, near San Jose, California. I attended my first MH conference in 2005. As a matter of fact, that's where I met the woman who, although an editor at the time, was to eventually become my agent: Rachelle Gardner. In subsequent years, I was fortunate to make the acquaintance of such noted authors as Gayle Roper, James Scott Bell, Randy Ingermanson, Karen Ball, Brandilyn Collins, DiAnn Mills, and several others. I also became friends with writers who went on to become published authors: Austin Boyd, Shawn Grady, Cathy Cushman, to name just a few. I met a number of editors, and found that most of them were quite nice--not the fire-breathing monsters the neophyte author imagines them to be. Likewise, I found that agents are human, as well. True, these are people who can literally control the destiny of a writer, and they take that responsibility seriously, but they can also have fun. And it's nice to find that out. I've looked forward to this conference for several weeks, because this year I've come full circle: from neophyte writer to published author and faculty member. That's twice in my life I've been able to close that loop, since I obtained my medical education from the University of Texas Southwestern Medical Center and, after 26 years in private practice, returned to serve for ten years as a Professor on the faculty of that institution. That was quite a thrill, and I imagine this will be, as well. I have some interesting posts lined up in my absence, starting with my interview of medical fiction writer Candace Calvert on Monday. I think you'll enjoy it. PS--If you're in the Dallas area, join me at Legacy Books on Thursday, April 8, from 7:00 to 8:30 for my launch party and signing. I'll have a few words to say about the writing process, do a brief reading, and we'll all have cake and coffee. Y'all come. 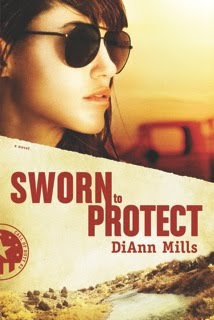 Today I’m privileged to have as my guest my friend, fellow Texan, and award-winning author DiAnn Mills. DiAnn launched her career in 1998 with the publication of her first book. Currently she has fifty books in print and has sold 1.5 million copies.Six of her titles have appeared on the CBA Bestseller List. Three of her books have won the distinction of Best Historical of the Year by Heartsong Presents. 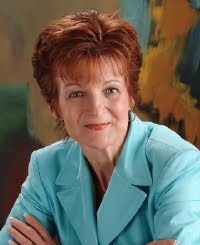 Five of her books have won placements through American Christian Fiction Writer’s Book of the Year Awards 2003 – 2008, and she is the recipient of the Inspirational Reader’s Choice award for 2005 and 2007. She was a Christy Awards finalist in 2008. She and her husband live in sunny Houston, Texas. They have four adult sons and are active members of Metropolitan Baptist Church. RM: DiAnn, for those of my readers who don’t know you, tell us a little about how you began writing. DM: I can’t remember ever not writing. It was like breathing. Still is. But I never had the courage to take writing seriously until my husband challenged me to write a book. That was in ’96, and my first book was released in ’98. I pulled out a manuscript that I’d been hiding, learned how to use a computer, and took on the task of learning how to write from the pros. RM: You’re a mentor for the Jerry B Jenkins Christian Writer’s Guild as well as teaching across the country, but some people may not know that you open your home for mentoring clinics as well. Please tell us more about those. DM: I believe in helping other writers learn the craft of writing. I take what I’ve learned and apply it to a curriculum that focuses on characterization, plot, dialogue, and narrative with a heavy emphasis on emotive conflict. The sessions are three days long and limited to eight participants. And did I say homework? Participants work very hard! I’ve also taught the clinic at various writer’s conferences. RM: Your western historicals are very good and extremely popular, yet you’ve branched out to other genres. How did that come about? DM: I’d say the love of story and suspense. My mind is constantly whirling with “what-if.” Those moments can happen anywhere, anytime, and in any date in history. What intrigues me is a woman in a role that traditionally belongs to a man. RM: Your first book in the Call of Duty series was quite a success, and now the second book is about to launch. What can you tell us about Sworn To Protect? DM: Danika Morales is a Border Patrol Agent protecting the US borders along the Rio Grande River in Texas. But her oath has cost her. Someone is leaking information to the informants, and the only person she can trust may be betraying her. RM: And, as I always ask, do you have any last words for my readers? DM: I appreciate readers. We writers are spinning words without you. I invite you to visit my website. Sign up for my newsletter and look for contests there and soon on my facebook fan page. Again, I appreciate your reading my books. Thanks, DiAnn, for joining us. I highly recommend your books, and know my readers will enjoy them. My author's copies of Code Blue arrived this afternoon. The books are on their way from the warehouse to the various booksellers, and should be ready for order fulfillment soon. There's just something special about holding the first copy of your book, realizing that it represents the culmination of a long, long journey. And I couldn't have done it without the help of a lot of people. Thanks to you all. I enjoy the Matthew Scudder novels by Lawrence Block. Scudder is a former detective, a sober alcoholic, who calls upon his police experience to help him solve problems for friends. One of his favorite expressions, especially when he feels stumped by a problem, roughly translates as "Get up, get out there, and knock on doors." Sometimes, even when you don't want to, that's exactly what's needed to get an answer. My wife and I moved to this northern suburb of the Dallas Metroplex almost two years ago, but from time to time we go back to the southern suburb where we formerly lived. We did that just a few days ago, and while Kay was occupied elsewhere I dropped in to the local Christian bookstore to visit with the owner, a fellow Deacon at our former church and a man who'd always encouraged me in my writing. 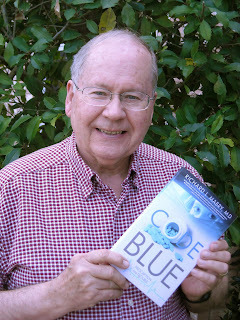 I'd had my publisher send him an advance copy of Code Blue, and we talked a bit about it. Like many authors, I'm embarrassed when it comes to asking another person to help publicize my novel. I mustered up my courage and said, "Charlie, maybe we can arrange a signing here after the book comes out. " My knock on his door was tentative. His response was anything but that. Not only will my friend look into my doing a signing at his store, he'll talk with a group of ladies from the church about making Code Blue the next selection of their book club. In addition, one of his employees will take the cover art, my photo, and other material I gave them and craft a Powerpoint presentation to run in a loop on the monitor that stands in the center of the door. Finally, they'll display a stack of bookmarks advertising the book. Authors, sometimes, you just have to get out there and knock on doors. The results may surprise you. They did me. My devotional, "Did You Get My Message," is the March 16 post for the Upper Room devotional guide. Hope you'll click here to read it. This is a busy time for me, with the official launch of Code Blue coming up soon, but I won't neglect my blog. I'll have interviews and guest posts coming up from time to time in the weeks ahead. Hope you'll keep coming back. 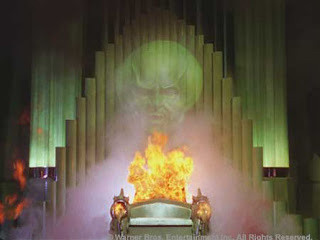 Do you recall the scene in The Wizard Of Oz where Dorothy and her companions find out that the Wizard is merely a product of a man behind the curtain? Some of you are preparing to attend a writer's conference, where you'll encounter agents and editors. Most of you hope to interest them in your work, either to represent you or to consider a proposal or (oh, happy day!) a full manuscript of your book. But, if you're like me at my first such conference, you'll be fighting to string appropriate words together and produce cogent sentences. It's as though you were standing in front of the Wizard, with knees knocking and voice quavering. So, here's a word of advice. These people may hold the keys for your future in publication, but in the final analysis, they're not the Mighty Oz. They're the man or woman behind the curtain. They're ordinary people who should be treated with respect, but not reverence. There's no reason to fear them. So how do you pitch to an agent or editor? First, do your homework. If an agent doesn't represent fantasy, don't try to interest them something of that genre. If an editor's publishing house specializes in Amish romances, don't waste their time and yours pitching a novel about space exploration. You get the picture. Most writer's conferences have a list of agents and editors attending, along with notes about what they are (and sometimes, what they're not) looking for. Pay attention and make your presentations accordingly. Second, be considerate of their time. Be on time for your appointment. Make your presentation clearly, having practiced and polished it until it shines. Allow them the opportunity to react and respond. Ask if they want your card (they may) and if they'd like you to send them a proposal (they may or may not). And when your time is up, thank them and leave. Don't pitch to them in the lunch line (it happens all too often), in the rest room (yes, that happens, too), or by cutting into a conversation they're having. That's a good way to get them to remember your name, but not in a positive fashion. And don't spend all your time at the conference trying to impress agents and editors. Make friends with other writers. You'll enjoy the experience. Oh, and don't forget to attend some classes. No matter where you are on your road to publication, you're never too far along to stop learning. One of the two writing magazines that I read regularly is Writers Digest. In the March/April issue, I found two pieces that were of particular interest to me--and may be to the writers who follow this blog. I subscribe to a number of "loops" populated by writers. On one in particular, I often see questions posted seeking tax advice as it pertains to writers. Asking peers for advice sometimes works, but I've always been of the opinion that you're better off getting the opinion (and help) of someone who's a professional. Bonnie Lee is certainly a qualified professional. In this article, she addresses self-employment taxes, the hobby-loss rules, and determining what might qualify as a deduction for a writer. There's the usual disclaimer at the end that it's best to consult our own tax pro, but for a clear and authoritative overview of a subject that often generates more heat than light, I recommend this one. I have a number of book signings coming up after the launch of Code Blue. I suspect that most writers share my reluctance to position myself as a book salesman at such events. That's why my eyebrows went up when I saw the article by award-winning author Elizabeth Sims on "hand-selling your book." She walks the reluctant writer through such steps as customizing your pitch, positioning yourself, putting aside modesty, closing the sale, and knowing when to quit. I plan to keep this article open on my desk and read it often. Maybe it will keep me from slinking off to lock myself in a closet at my next book signing. There's lots more in this issue, but so far as I'm concerned, these two articles more than justified my subscription cost--which, according to Ms. Sims, is tax-deductible. For those who might have missed my stinging wit and acerbic postings on Twitter and Facebook recently, Kay and I have just returned from five days of vacation. It was wonderful to get away, even though we were in a place where the Internet access was slow enough to make one consider learning how to use smoke signals. We could get a signal with our cell phone, but at a cost that would require a first mortgage on our grandchildren. And don't even think about talking on the land line in the hotel. All my book advances wouldn't cover those charges. So, we adapted. We watched a bit of CNN (they have it in English), read the International edition of USA Today, and in general decided to let the world get along without us. And, you know what? It did. My friend and colleague, Dr. John O'Rear, gave me some good advice when I was in residency (the years of specialty training that follow graduation from medical school). 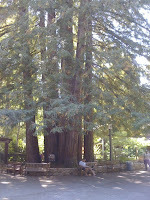 In his homespun wisdom, John told me, "Richard, sometimes you just have to get off the merry-go-round. And you'll be surprised when you hop back on that it's pretty much in the same place as when you left it." Now I'm adapting again. We have Internet access. Our phones work. The TV and newspaper keep us abreast of events. But I'm already looking forward to another time when we can go back for more rest, free from the electronic umbilical cords that tether us to our modern world. Oh, where did we go? 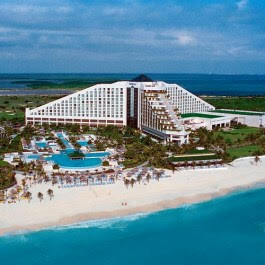 We joined good friends for a few days at the Hilton Hotel in Cancun. And lest you wonder how we managed that, I'll hasten to say that our stay preceded a meeting of a medical society of which I'm a member (although retired) and that group managed to secure a rate that was about half the usual one for this property. We vacationed at the bargain rate before the meeting began, then left, which brought home to me yet again the totality of my switch from practicing physician to retired physician. In former days, I would have stayed for the continuing education credits. Now, all I want is peace and quiet. And we got that in abundance. There are so many things you don't even think of when you're writing a book. One of them is a launch party. I recently attended the launch party for local author Mary DeMuth's memoir, Thin Places. There was a nice crowd in attendance. Mary talked for a while about writing a memoir, then she cut the cake--a delicious replica of the cover of her book--and signed books. It was low-key and fun. I'd already scheduled my own launch party, to be held at the same place as Mary's: Legacy Books in Plano. It's set for April 8 at 7:00 PM, and each of you reading this should consider this a personal invitation to attend. I'll probably do something fairly low key. However, I have read of fellow authors who had gala launch parties with bands, prizes, food, and all sorts of hoopla. And I have to admit, that makes me a little nervous. That's just not my style, and I hope none of you who attend will be disappointed that I haven't booked a rock band and had my son-in-law design a spectacular light show in the manner of the Super Bowl halftime. Anyway, those are my plans for a launch party. Authors who read this, what have you done or what will you do when your book launches? Ideas are welcome. Recently, I noticed that the movie, Maverick, was showing on one of the classic movie stations. Kay couldn't believe I'd never seen it, although I had managed to catch and enjoy a few episodes of the TV show. So, I recorded the movie and we then spent 135 minutes watching it. Here's my review: James Garner's talent for deadpan comedy was underutilized. Mel Gibson's acting ran the gamut from A to B (I stole the line, but don't recall from whom). Jody Foster alternated between being a vamp and a scamp. And--here's where I finally reach my point--there was a shameful lack of a single, defining story arc. Oh, sure, Maverick wanted to get enough money to join a high-stakes poker game, but to get to the end it appeared to me that the writers stitched together several one-act plays with very little to hold them together. Just my opinion, of course. What does that have to do with writing novels? Lots. My first novel dealt with a physician who'd failed at professional baseball (write what you know! ), only to have the opportunity to attend a fantasy camp and possibly redeem his career. I thought it was great, but looking back I can see that the editors were right. There was no hook, no defining story arc, no quest that was the driving force. When my then-agent suggested I try writing cozy mysteries (an activity at which I failed miserably) she warned me that these were short, simple novels and there wasn't room for multiple plots. Keep it simple, and stay on point. And you know what? That works very well in writing a full-length novel. There may be subplots. There can be character issues. But driving it all there must be a goal to which everything is tied without taking too many side trips. Novelists, do you agree? Or is it just me? Then, there's life (for which we're all grateful). What makes you roll out of bed each morning? Why do you keep doing what you're doing? Is it money? I hope you make some, but if that's your goal, life's going to get pretty stale fast. Is it fame? Good luck, but the odds are against you. Is it satisfaction at doing something and doing it well? You're getting closer. Is it the desire to live the best life possible, to do the right thing by your family and set a good example for others, and to honor the God who gave you life? Bingo. Don't make your life a Maverick movie. Keep your purpose in front of you, let it drive you, and don't make too many side trips. Enjoy.